KCOU 88.1 is a broadcast Radio station from Columbia, Missouri, United States. The University of Missouri's completely student-run station. Broadcasting since 1963, it features the ... See more best in new and emerging music from a variety of genres along with a focus on Mizzou news and sports. 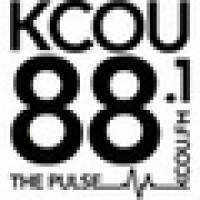 Broadcasting live over the air, online @ http:// kcou.fm, and on Facebook (click on the "Listen Live!" tab up top)!